 Hotel Monteleone is one of only three U.S. hotels to receive the prestigious Literary Landmark designation by the Friends of Libraries, USA, so you might say that the history of literature is an important pillar upon which our luxury New Orleans hotel finds foundation. So many important literary figures and famous authors have claimed Hotel Monteleone as a home away from home, including, but not limited to, William Faulkner, Richard Ford, Eudora Welty, Rebecca Wells, Sherwood Anderson, and Stephen Ambrose. 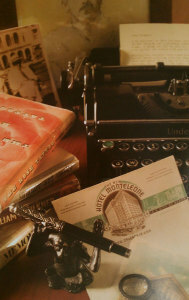 Just as our hotel served as inspiration to them, these authors have served as inspiration to us. Take a peek at a few of our Literary Suites at Hotel Monteleone, our way of paying homage to these wonderful literary figures. Parlor dimensions are 15 x 15’6″ – 232.5 sq. ft. Entire suite is 698 sq ft.
William Faulkner’s love of Hotel Monteleone inspired this lovely suite overlooking the French Quarter. In 1951, Faulkner stayed here while in town to receive the French Legion of Honor Award. The suite features marble and granite bathrooms, as well as a portable telephone, high-speed Internet access, and other upscale amenities. The William Faulkner suite offers a luxurious bedroom with two-double beds. 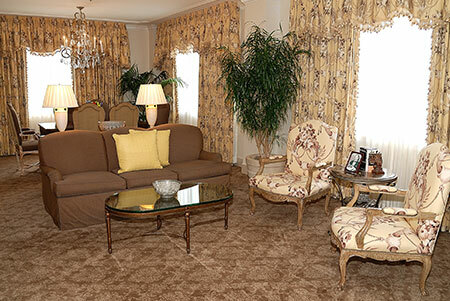 The parlor area has a sofabed and offers a built-in wet bar, refrigerator and ice maker. Parlor dimensions are 17’7″ x 24″ 8″ – 434 sq. ft. Entire suite is 830 sq ft.
Truman Capote was fond of telling the press that he was born inside Hotel Monteleone. In fact, the Hotel assisted his mother with transportation to Touro Hospital, where he was actually born. 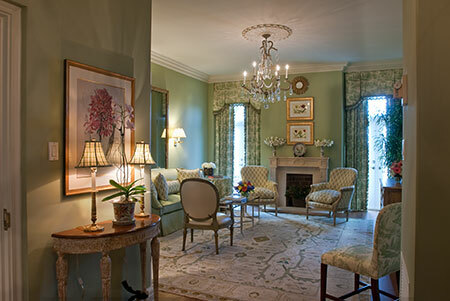 Overlooking the French Quarter, this beautifully appointed suite reflects Capote’s personality. 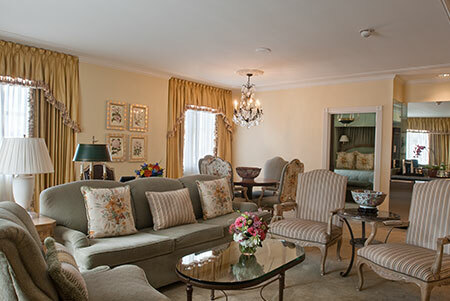 The one-bedroom suite offers a king-sized bed and a comfortable parlor with a dining table with 4 chairs. The marble and granite bathroom features a Garden tub and separate glass shower. The suite features a portable telephone, high speed Internet, wet bar and ice maker, refrigerator and other upscale amenities. Parlor dimensions are 20′ 5″ x 29′ 6″ – 602 sq. ft. Entire suite is 1,104 sq ft.
Tennessee Williams featured Hotel Monteleone is his play, The Rose Tattoo. Until Williams purchased a fine mansion in the French Quarter, he often stayed at Hotel Monteleone. 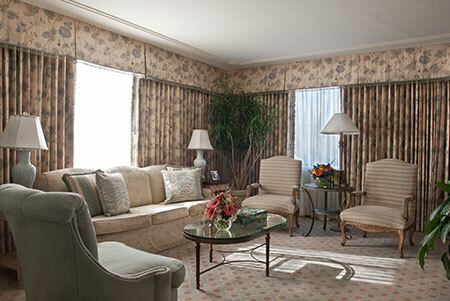 The Tennessee Williams suite offers a luxurious king bedroom and granite bath with Jacuzzi tub and glass shower. The suite also offers a sofa bed in the parlor, dining table with 6 chairs, bar area, plus a magnificent view of the French Quarter. The marble and granite bathrooms include a garden tub and separate glass shower. The suite features a portable telephone, high-speed Internet access, wet bar and ice maker, and other upscale amenities. Parlor dimensions are 16′ x 19′ 304 sq ft. Entire suite is 935 sq ft. Connecting bedroom is 490 sq ft.
Ernest Hemingway stayed at Hotel Monteleone and mentioned the Carousel Bar & Lounge in his short story, The Night Before Battle. So, it is fitting that the Hemingway Penthouse be located in the section of the hotel that once housed the Union Troops. This unique suite with dual balconies offers both City and French Quarter views and is adjacent to our rooftop pool and fitness center. The penthouse main bedroom has a king bed, while the optional connecting guest room is a preferred room with two double beds. The marble and granite bathroom includes a Garden tub and separate glass shower. The suite features a bar, refrigerator, ice maker, portable telephone, high speed Internet, and other upscale amenities. Parlor dimensions are 22′ 4″ x 24′ 6″ – 767 sq. ft. Entire suite is 1,045 sq ft.
Hotel Monteleone’s famous Carousel Bar & Lounge is featured in Eudora Welty’s short story, The Purple Hat. 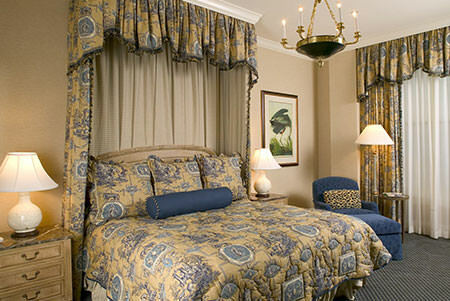 The Eudora Welty suite offers a luxurious king bedroom and granite bath with Jacuzzi tub and glass shower. The roomy parlor offers a panoramic view of the Mississippi River, along with a sofa bed, plasma television, wet bar and many other amenities. The Eudora Welty suite includes a marble and granite bathroom featuring a garden tub and separate glass shower. The suite also offers a portable telephone, high-speed Internet access, and other luxury hotel amenities.